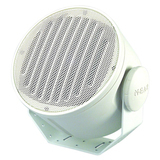 A-Series A2T NEAR Indoor/Outdoor Loudspeaker is compact and designed for smaller spaces or applications. Its high audio intelligibility and superb articulation make it the ideal loudspeaker for music or paging, inside or out. Designed to perform beautifully under the toughest conditions, the A-Series A2T NEAR Indoor/Outdoor Loudspeaker combines outstanding aesthetic design with patented speaker technology for unsurpassed audio quality and weatherproof durability.